Have you ever wondered how you could possibly build a digital microscope for a much smaller cost than buying one? Well, the cost of building a microscope is more like $20, but compared to the average cost of scientific microscopes, it might as well be 3 cents! You probably already have most of the tools that you need right in your lab or at home! 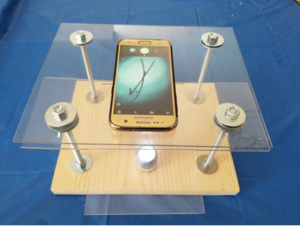 If you have a smartphone, then you already have the camera for your new microscope. You can build this microscope in about an hour once you gather all the necessary supplies. 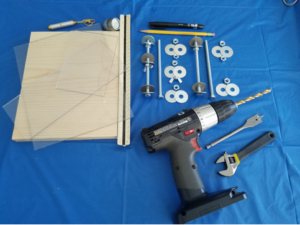 * None of these are needed if you are making a plexiglass stand. It is not necessary to make the base for your microscope. However, think about how much your smartphone photos are when the phone is steadied up against something immobile (especially on high zoom), as compared to an unsteadied ‘free hand’. Imagine how much more any movement will be amplified by a magnified lens! Then, consider how inexpensive and quick it is to make the plexiglass stand for your homemade microscope set-up! If you do not already have an inexpensive laser pointer that you are willing to pull apart in order to pull out the focus lens, then you can purchase one of these laser pointers at a store for about $5. If you have trouble finding a laser pointer, check at your local pet store, because cat owners love these laser pointers for amusing their cats for hours. Make sure that the laser pointer is not a two-in-one laser pointer with a white light, because these will not work for this purpose. Also, make sure that the tip of the laser pointer is a curved surface, not a flat surface. Just about all lenses from small laser pointers will work as a macro lens, particularly if they have a curved surface that can be screwed on and off. Unscrew the curved tip of the laser pointer. Unscrew the plastic casing (typically black) that contains the focus lens. You might need to use a pair of pliers to get a better grasp on the casing that houses the focus lens. Pull out the focus lens. 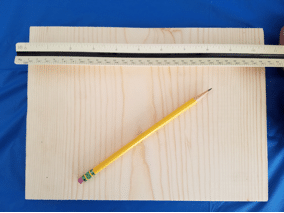 Use a ruler and black marker to mark a spot in each corner of the wood that is 1.5” in from all sides. Mark all four corners of the plywood. Lay your plywood down onto your scrap piece of wood. 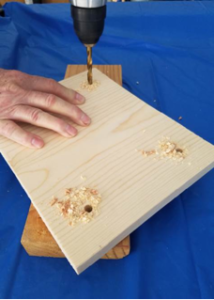 Use the larger drill bit (5/16”) to drill the four holes into your plywood. 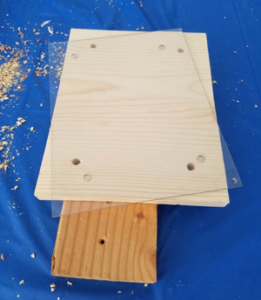 Use a ruler to find the center of the 8” x 10” piece of plexiglass, in line with the front two carriage bolts. The focus lens needs to be as close to the smartphone camera as possible. If the smartphone has a case, then you only want to insert the focus lens into the plexiglass enough so that a portion of the focus lens protrudes out of the top of the plexiglass, in order to come flush in contact with the smartphone camera lens. If the smartphone does not have a case, then embedding the focus lens into the plexiglass so that the top of the focus lens is flush with the plexiglass will still allow it to be just about flush with the smartphone camera. Use a tiny drill bit (1/16”) to drill a starter hole in the plexiglass to avoid cracking it. 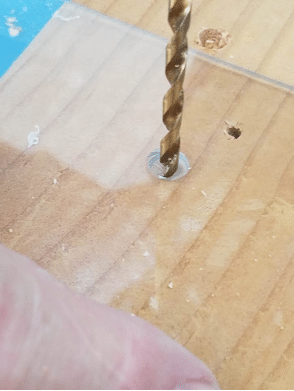 Use the larger drill bit (5/16”) to drill a countersink hole in the plexiglass for the focus lens, but do not drill all the way through the plexiglass. 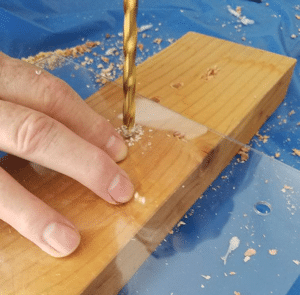 Press gently to get the drill bit started going through the plexiglass and then allow the grooves of the drill bit and the force generated by the drill to pull it down as you gently apply pressure to the drill. Test to see whether the focus lens fits into the plexiglass. 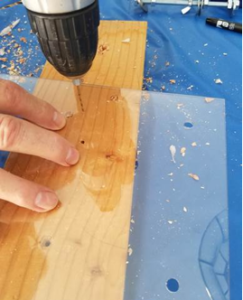 If the lens does not fit, use sand paper or a file to gently shave off some of the plexiglass. Continue checking regularly to see when the focus lens fits snugly into the plexiglass. 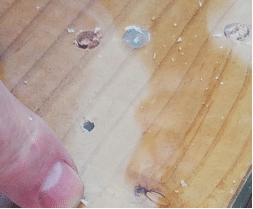 Once the lens fits down into the countersink hole, then drill through the center of the countersink hole, all the way through the plexiglass with the medium drill bit (11/64”) to make an opening for the lens to visualize the sample below. Place the 8” x 10” piece of plexiglass down onto the carriage bolts. Use a pencil to mark inside the focus lens hole in the plexiglass. 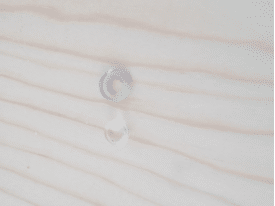 This spot now marks the location of where the center of your LED light should be placed. 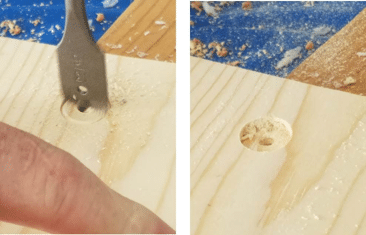 If your LED light does not sit flat on the surface of the plywood base then use a wood countersink drill bit to countersink the LED light into the plywood. Make sure not to drill all the way through the plywood base. 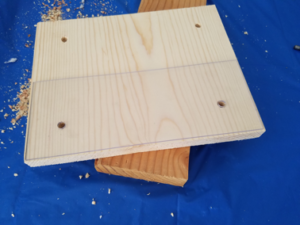 Insert the carriage bolts into the underneath side of the plywood base. 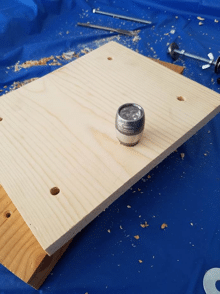 Flip the plywood over and add washers to the top of all four carriage bolts. 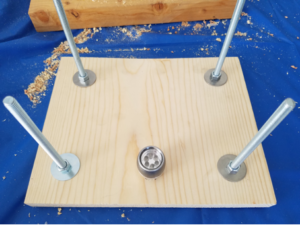 Secure the carriage bolts and washers to the plywood base by adding nuts directly adjacent to the washers. Notice that the focus lens (from the laser pointer) has two different sides – a curved side and a flat surface. The flat surface side of the focus lens is the lens that must come in flush contact with the camera lens of your smartphone. Gently press the focus lens into the 8” x 10” plexiglass camera stage. Add wingnuts and washers to the front two carriage bolts. Add the 4” x 8” specimen stage on top of the washers. Add nuts above both sides of the specimen stage. Add nuts to the back two carriage bolts as well. Use a level device or app on your smartphone to ensure the specimen stage is flat and level. 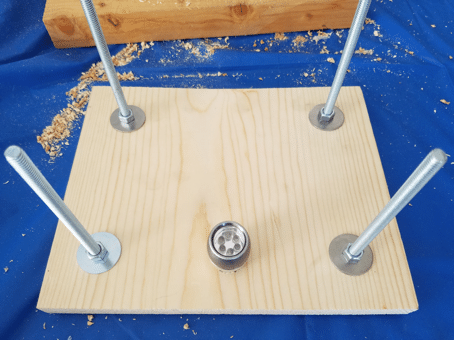 Add the 8” x 10” plexiglass (camera stage) down onto all four carriage bolts, directly above the nuts (previously added on top of specimen stage). Add nuts to all four carriage bolts, directly on top of the camera stage. Above you can see two eyebrow hair shafts. If you want to increase your magnification you can use a second focus lens directly beneath the first focus lens. Insert it just slightly into the bottom of the plexiglass camera stage (8” x 10”). Use the smaller 1/8” plexiglass (2” x 4”) slide for your specimens. 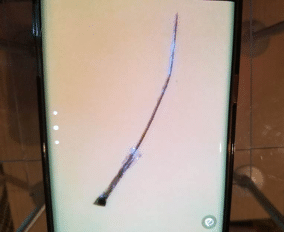 Below, you can see an eyebrow hair follicle and shaft (left), and the outer root sheath cells from another eyebrow follicle when the zoom feature of the smartphone was used (right). You Have Built Your Microscope – Now What? Great as a portable microscope. An excellent starter microscope for beginner microscopists (younger students in your lab, such as rotation students, undergraduates, or non-research medical students). It can serve as an additional microscope, if you have a commercial microscope that is in use by other lab members. This type of microscope is also great for younger students (primary grade student (K-12), particularly when schools do not have funding to purchase commercially produced microscopes. By allowing your lab members to have hands-on activity in building one of these microscopes, the lab members gain a better understanding of how each component of the microscope functions. Building your own equipment can be as fun and engaging as the science itself! Creativity and imagination lead to great discoveries. Enjoy your new microscope and everything you use it to explore.